My first impression of the "type of woman" who would get Botox came from an episode of The Real Housewives of New York. In season one, we follow housewife Ramona Singer—who is portrayed as being superficial, high-society, and obsessed with youth—into the doctor's office to get a little prick here and there to zap the wrinkles on her forehead and on either side of her eyes. Ramona had long blonde hair and wide brown eyes, and her gaze was deemed the creepiest on reality TV since her pupils were the only part of her face that could actually move. Fast-forward nine years. I was 25 and had hopped tentatively aboard the train of body-altering beauty procedures. I'd bleached my hair blonde and dabbled in spray tans and eyelash extensions. But so far, I had yet to let anyone stick me with any needles, still hanging on to some of that residual judgment that those who did went "too far." A couple years prior, I'd had a cosmetic dermatologist evaluate my 22-year-old face for an article about how much Botox people of different ages really "need." I'd never been self-conscious about looking wrinkly, so when she told me that the vertical lines between my brows (my "angry 11s"—a product of two decades of frowning), were starting to show and that I might benefit from coming in once a year for $300 worth of preventative Botox, I was genuinely offended. I was 22! I did not have wrinkles. Having someone tell me I "needed" Botox put me off of it even more. For years, I stood by that resolution. Every so often, an invitation to go to an "injectables" party in Beverly Hills would cross my desk—I'd picture Real Housewives and pass. A friend of a friend got a job at a local medispa and told me if I ever wanted Botox, she could give me her friends-and-family discount. Again, I told myself that I wasn't that old, I wasn't that superficial, and it wasn't for me. But oh how quickly your tune can change the moment you actually see yourself start to age. A few months before my 26th birthday, a photographer friend of mine named Katie Neuhof came over to take some shots of me with her film camera. I love film photography, so I was pretty pumped: To me, seeing photos on film is like listening to music on vinyl. It's more authentic, has more texture. Which is lovely, but at the same time, very unforgiving of any imperfections in human skin. When the photos came back, I giddily flipped through them (still obsessed with them, Katie! ), until one photo stopped me in my tracks. Under the beautiful but merciless lens of Katie's film camera, I saw plain as day those angry 11s that dermatologist had told me about years before, plus a few etched-in forehead lines. It's not as if the lines were extreme, but they were there, staring back at me, an undeniable physical symbol that one day I wasn't going to look like—or be—a young person anymore. According to the plastic surgeons and cosmetic derms who administer Botox every day, those notions I had about the "type" of person who gets Botox don't represent their real clientele at all. (Go figure: You can't believe everything you see on reality TV.) In fact, according to Beverly Hills plastic surgeon Paul Nassif, MD, co-host of E! 's Botched, getting Botox in your 20s (for men, too) is more common than ever. 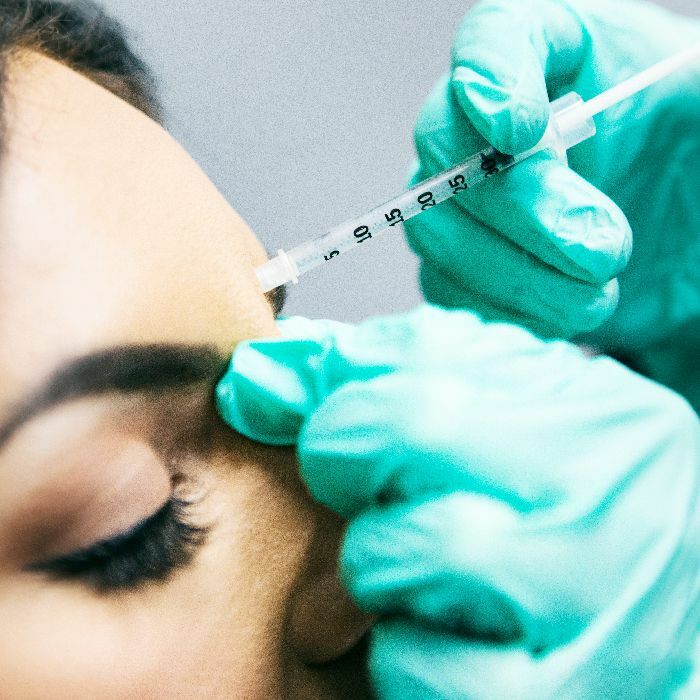 "Preventative Botox is becoming more and more popular amongst millennials, partially due to the fact that the 20-something generation is highly researched and familiarized with the aging process and learning about how to make it stop," he says. "In my medical spa, we use nonsurgical procedures such as Botox as a preventative measure within the 20 to 29 age range almost every day." The benefits of starting Botox earlier, as opposed to waiting until your wrinkles are already "static," or deeply etched into place, is that you train your face not to form the lines at all. This is something that Jennifer Leebow, a nurse practitioner at LABB (a Botox and filler boutique in L.A.), says is "the best investment one can make on their skin." As Leebow explains, "It allows the muscle to remain upright and results in natural movement, which limits the appearance of deep lines and wrinkles over time. If you prevent fine lines from developing, you will always be able to maintain preventative treatment as opposed to corrective treatment. This requires less Botox and less frequent visits … over time." Of course, lifestyle, genetics, and skincare habits all factor into how early your wrinkles will show up, but Nassif says he's administered Botox on clients as young as 19. There are absolutely no disadvantages or side effects (other than a tiny bit of temporary swelling at the injection site). And depending on the cost and needs of any given patient, preventative Botox costs between $500 and $1000 per year (which is definitely less than I spend on my hair and lash extensions over the course of a year). Certainly, no one "needs" Botox, just like no one "needs" to bleach their hair or artificially tan their skin, but having all the information laid out in front of me, the taboos and judgments about this one arbitrary procedure just seemed so senseless. I've had two Botox sessions in the last six months (the first was just a mini dose to see how I liked it; needless to say, I did, and I went back for more). Both sessions combined cost about $350 total. And to my absolute delight, those angry 11s and forehead lines have totally disappeared, allowing my makeup to go on smoother than ever. I haven't had any film photos of me taken since, but Katie, if you see this, definitely hit me up for a re-shoot, sans wrinkles. In the name of minimizing the scandal and shame that still exists surrounding Botox, I've come to telling everyone who compliments my skin that I've had it done. Every time, I demonstrate my frozen forehead by raising my eyebrows as hard as I can, and we all share a laugh about how little it moves. "But you don't seem less expressive!" they always say (surely images of Ramona and her buggy eyes springing to mind). "I would never have even noticed." "It's really not that intense," I tell them, happy to serve as their new "face" of Botox. It's my little way of showing that you can be a normal, non–Real Housewife type of person and still flirt with injectables once in a while.